It’e 2019 and in a continued effort toward health and wellness, it seems that more and more food swaps are being made. The most common? Cauliflower. Cauliflower seems to have become the ultimate carb replacement, making an appearance in substitutes for pizza crusts, pastas, and perhaps the most common- rice. So does it live up to the hype? We think so! At least this chicken fried cauliflower rice surely hits the mark. 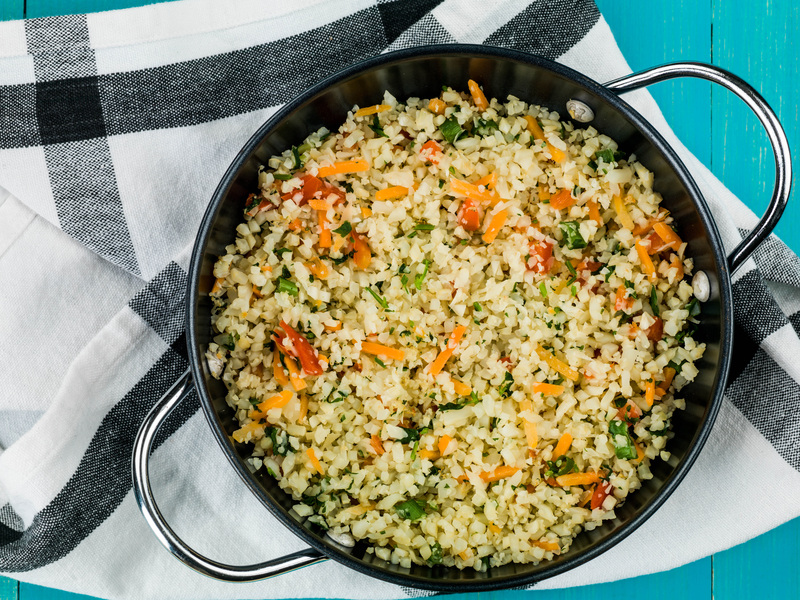 With all of the flavor of your beloved takeout, this you’ll be shocked how you don’t have to sacrifice flavor to save a ton of carbs and calories! Working in batches, place cauliflower into the bowl of a food processor fitted with the blade attachment. Process into small crumbles that resemble rice, then set aside. (Skip this step if using pre-riced cauliflower). In a large skillet over medium heat, heat 1 tablespoon oil. Add onions and cook, 2 minutes, then add garlic, ginger, peas, and carrots and cook, 5 minutes more, stirring often. When vegetables have softened, add chicken and chili paste and cook, 2 minutes. Add riced cauliflower and cook 2 minutes, stirring often. Push rice mixture to one side of the pan and crack eggs into the open area of the skillet. Add one teaspoon soy sauce to eggs and scramble. Once cooked through, stir eggs into rice mixture. Add remaining 4 teaspoons soy sauce and stir. Continue cooking until everything is heated through and soft, 5 minutes. Remove from heat and drizzle with sesame oil. Sprinkle with green onions and serve.